A national, online eLearning resource is now available for staff who complete the medical and health information for birth certificates and fetal death reports at hospitals or free standing birth centers. Applying Best Practices for Reporting Medical & Health information on Birth Certificates is for novice and experienced birth information specialists, obstetricians, midwives, nurses who care for pregnant women and new mothers, and anyone interested in public health and the national vital records system. The Office of Vital Records expects new birth registrars to complete the one-hour course within six months of becoming an MR&C user. Course completion by birth registrars will be monitored by OVR. 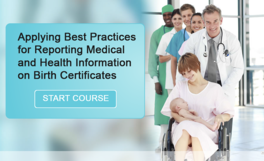 The online course is free and available any time at www.cdc.gov/nchs/training/BirthCertificateElearning. Once you have completed the one-hour course, continuing education credit is available through the CDC Training and Continuing Education Online system. OVR encourages birth registrars to make nurses and physicians aware of the course. A certificate of completion is available for non-clinical professionals. Vital records data is essential to ensuring women, children, and infants in Minnesota are healthy and thriving. The Community and Family Health (CFH) Division at Minnesota Department of Health (MDH) utilizes vital records data every day to plan and evaluate programs and to answer legislators’ questions about the health of women and infants in Minnesota. Vital records data is an essential element that enables us to identify and quantify health-related issues, inform programmatic and policy decisions, and measure progress toward public health goals, such as Healthy People 2020. Accurate and timely documentation of births and deaths is critical to almost everything we do from monitoring infant deaths to caring for children with congenital anomalies to evaluating effectiveness of family planning programs. One project CFH has been actively engaged with is Minnesota’s new Early Childhood Longitudinal Data System (ECLDS). ECLDS is an innovative tool that combines data collected by the Minnesota Department of Education, the Minnesota Department of Human Services and MDH into one online, interactive database. Birth data from vital records is one of the important datasets included in the data system. Research shows that a person’s health and emotional wellbeing is rooted in early childhood. Early childhood experiences lay the foundation for all that is to come. A rich and supportive environment can help children thrive throughout their school-aged years and their adult lives. ECLDS helps us examine how our programs are working for young children in a new and integrated way so we can identify and strengthen successful programs and improve our ability to help children achieve their greatest potential. The newest release of data from ECLDS was the ‘Birth to Third Grade’ cohort. 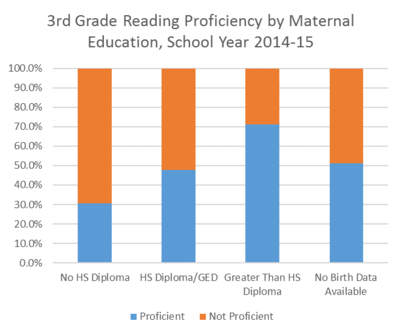 These data examine the relationship between third grade attendance and reading/math proficiency with birth outcomes and maternal characteristics obtained from vital records birth data. One finding worth noting is the correlation between maternal education (e.g. mother’s educational attainment at the time of the child’s birth) and third grade reading and math proficiency. As the education of the mother increases, so does the success of her child. This information helps support the work of Family Home Visiting, Women, Infants, and Children (WIC) and other programs in CFH. It also supports the push for more early childhood education programs to better prepare children for school. More than 120 Local Issuance Officers representing more than half of Minnesota's counties attended Safe and Secure Vital Records Training on November 14, 2016, in Brooklyn Park, Minn. The event was developed by the Office of Vital Records (OVR) with input from the Minnesota Association of County Officers (MACO) Vitals Committee and AmeriTech Inc. AmeriTech Inc. is the company that produces Minnesota vital records paper through Northstar in Brooklyn Park, Minn. The program for the day included general sessions, breakout sessions and a tour of Northstar. Safe and Secure from Forest to Certificate Paper - Northstar/AmeriTech Inc.
Three breakout sessions dealt with: Quality Improvement: Knowing Your Customer and Knowing You Meet Their Needs; Operationalizing Fraud Prevention and Reducing Security Risk; and Policies, Procedures, Best Practices and More. The next Local Issuance Office Training is on Monday February 6, 2017 from 3:00 p.m. to 6:00 p.m. in Bloomington, Minn. This training event is scheduled for the afternoon before, and at the same location, as the 2017 MACO Annual Conference. There is no cost for the class but registration is required. Registration for the OVR training session is separate from registration for MACO. Find registration information for Safe and Secure: Training for Vital Records Officers on the Minnesota Department of Health Information for Local Issuance Offices website. It has been a while since MR&C has had any updates, but that doesn’t mean that our developers have been idle! Sometime in the next few weeks, or very early in 2017, MR&C will look a little different and have an improved user interface. You will receive MR&C Release Notes by email several days before the change occurs. Cindy Coleman, OVR's MR&C expert recently moved to another state agency. Her last day with the Office of Vital Records was November 15, 2016. If you need assistance on something that Cindy would have helped you with in the past, call 651-201-5993. December 20, 2016 from 8:15 a.m. to 9:45 a.m. All OVR staff will attend. Responses to phone messages will be made following the meeting. The Office of Vital Records is closed on Monday, December 26, 2016 and Monday, January 2, 2017. February 6, 2017, 3 p.m. to 6 p.m. Safe and Secure: Training for Vital Records Officers, DoubleTree by Hilton Hotel in Bloomington, Minn. Registration information is on the MDH Information for Local Issuance Offices website. Training for other professionals involved in vital records is being scheduled for 2017. Classes, dates and registration information will be announced in future issues of Vital Records News.